The launch trailer for Deus Ex: Mankind Divided offers a look at the game's world and Adam Jensen in action. We're less than a week away from the launch of Deus Ex: Mankind Divided, and Square Enix has dropped the game's launch trailer. 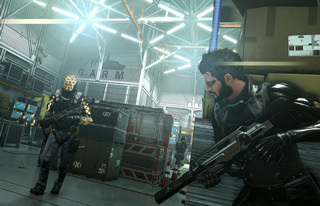 In a world where augmented people are being oppressed, Adam Jensen is taking on those behind it: the Illuminati. As you'd expect, there will be different paths to take. Whether you choose to take the stealthy route or the more aggressive combat option, you'll have to deal with consequences of your choices. There are plenty of people looking forward to Mankind Divided, especially considering how well-received Deus Ex: Human Revolution was. We'll find out if the sequel lives up to it when Deus Ex: Mankind Divided launches next week on August 23. That's not nearly as good as the old trailer, despite cribbing most of the footage from it. It's a decent trailer, but I wish that they didn't recycle old footage to make it. Especially not for the launch trailer. I'm torn between wanting to see new footage and not wanting to see whole game in the trailers. Looking at you, Mafia 3. Woah! Now that's some next-level stealth if you can't even see it in the trailer. What is up with the Escapist restricting full screen on YouTube videos they share? No there website I visit does it. Mafia 3 did it right though. Actual gameplay before game released!